Call us Today at 844-294-0779 for a price quote! The MAX BR1 Slim is compact (1.1 x 3.8 x 4.8 inches) and tough enough to install just about anywhere, and it offers advanced features such as GPS fleet tracking, remote management, and USB or terminal block power capability. Redundant SIM slot with automatic switching for reliable network. You can also set the MAX BR1 Slim to automatically switch SIM cards when you’re in danger of exceeding a data cap. It also allows you travel across borders without changing SIM cards manually. Connect one of the two built-in 5V micro USB ports to a 10000mAh power bank for up to 7 hours of operation. Running low on power? Connect a second power bank before disconnecting the first for uninterrupted networking. The MAX BR1 Slim automatically re-establishes your SpeedFusion VPN connection on lower priority link when your primary WAN fails. Your VPN stays up, and you stay seamlessly connected. Track and manage your fleet from anywhere. With built-in GPS and InControl 2 cloud-based management, you can keep tabs on location and manage your mobile network from any Internet-connected device. Branding your captive portal is as easy as uploading your logo and terms & conditions. You can easily set bandwidth allowance and access duration per user or manage access using RADIUS or LDAP servers. The MAX BR1 Slim gives you full-featured LTE Connectivity in a package that measures just 1.1 x 3.8 x 4.8 inches. Its rugged metal enclosure stands up to moisture, dust, and vibration. It gives you and your devices, such as surveillance camera, LTE connectivity anywhere. 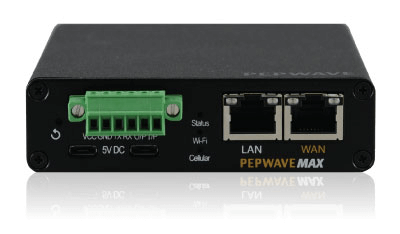 Download the Peplink MAX BR1 Slim Datasheet (PDF).